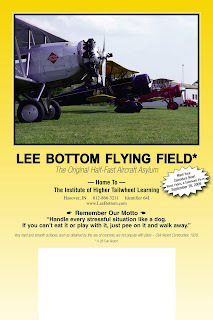 Each year for the past 24, the Lee Bottom staff has produced and mailed a limited number of calendars to friends of the airport. These unique items are printed in a format that was popular many years ago but nearly non-existent today. On the face they have one photo from the field, a motto, and an old fashioned tear off calendar pad. Back in 1987 only a handful of these calendars were produced but today the number stands, as it has for years, at 1500. Hand stamped with a unique number each one goes out to friends of the airport around the world. Admittedly though, it is very difficult to make sure they go to the right people. Therefore, if you get one and you don’t deserve it, consider yourself lucky. If you do deserve one and yet you don’t get one, then for that we are truly sorry. 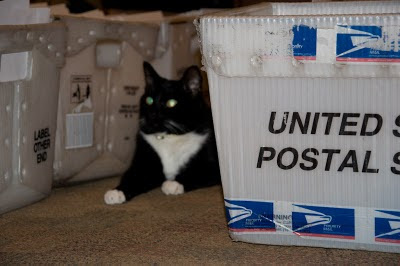 As for the photo you see above, when we finally pull everything together, sort them for bulk mail, place the envelopes in the postal tubs, and get them ready to go out the door, there is little room left in our house. This short term crowding inevitably leads to some interesting photos. With very few square feet of heated rug remaining, this year our cat, Meatball, quickly figured out that the one open space was just right for him. Here you see him hiding from the dogs just before we took them to town and shipped them off to you. As usual, both the photo and motto are secret. Each year these items change and to make sure there's a bit of surprise, we wait until their new owners receive them to publish a photo of one. Yet, since there are some of you who may not have seen one, here's a photo of last year's production. For those who've no doubt noticed that it’s late for calendars to be shipped, we prefer to think it’s better late than never. We hope you enjoy them. Note: If you would like to know more about the calendars, click here.